Large, lush green space and Stadium Plazas: All available and fully grown when the Vikings come in 2014. It is a local myth that Bob Dylan’s 1965 hit “Positively 4th Street” was written about our own little University commercial node. The well-known shopping, eating, and party-spilling area of Dinkytown does indeed have a strong history, starting as its own streetcar node before the University was the true engine it is today and essentially took it for its own. Dylan’s implant is seen everywhere around Dinkytown, whether in the Loring Pasta Bar (where Dylan once lived) or the mural around the eyewear store on 13th Avenue. The presence of such a force has epitomized Dinkytown and its conservative, non-changing form. Other than Sydney Hall, the area hasn’t expanded its retail in several decades, and the now well-known controversies with the House of Hanson site and the UTEC Building truly epitomize the resistance to the change in that four block area. This makes way for Dinkytown’s kid commercial node, Mr. Stadium Village, to pick up the pieces and run with them. “SV” doesn’t have the history or historic aesthetics like Dinkytown does; it doesn’t have 4th Street, Al’s Breakfast, or the experience of this on a regular basis. What it does have, though, is a willingness to change, adapt, and grow. Many people think that Dinkytown is fully expanded and no longer needs to grow and adapt, as evidence by sites like Save Dinkytown. Several businesses have expressed serious concerns, and according to interviews, some say that it would drive businesses out of the area. Even though slightly outdated, the Marcy-Holmes Neighborhood Master Plan includes Dinkytown, and states that they disapprove of ”Large scale (large footprint) buildings or buildings taller than four (4) stories in Dinkytown that conﬂict with the existing character of the area.”Although the concerns are warranted, the neighborhood has and is constantly changing. The new developments allow a much more transient student population to live closer to campus, thus inducing more demand for corner grocery stores and restaurants. Whereas Dinkytown seems to be resisting change, the opposite is the case for Stadium Village. Within the past four years, the development along the Washington Strip has boomed – even with the Green Line Construction at full swing. The businesses along the stretch have done reasonably well, considering the circumstances, thanks to the foot traffic from the growing local student population. As far as a plan for the future, the Stadium Village / University Avenue LRT Station Master Plan desires new density, for not only housing, but for retail and implementation of the nearby research park. In new development study areas, 8 land masses are included within the artificial limits of Stadium Village (arbitrarily chosen as between Harvard Avenue & the new LRT Station). Among these 8 areas, one has already been developed, one is currently under construction, and two are slated to begin shortly. All of these new developments are at least 6 stories, which add much desired density to the area. Also, according to several records of minutes at Prospect Park / East River Road Improvement Association meetings, a large portion of the permanent population want to see the density occur. The bottom line: Stadium Village wants to grow, and Dinkytown wants to keep living the Dylan-influenced Glory Days. But why is this the case? Why would two similar commercial nodes within a mile of each other have completely separate attitudes to change, even as they both offer the same type of business? In 1970, a locally famous protest occurred right along 4th Street across from the Varsity Theater. A fast food joint called Red Barn, which already had a location in Stadium Village, was planning on building a second location in Dinkytown. The protests escalated so much that a class-action lawsuit was filed against the developer and the wrecking crew that was planning on tearing down the old building was halted in their tracks. Eventually the Red Barn was red & dead, but the mural by Tony’s Diner & Camdi relive the memory. Fast-forward to 2002: After the Gopher Hockey Team won the National Championship for the first time in a quarter-century, celebration riots began in Dinkytown, where a mob of ~1,000 jumped on cars and started fires in trash bins (A fun reverie for your reading pleasure). There are two similarities to these two moments: Both were rooted in Dinkytown, and neither occurred in Stadium Village. Even though you could count the boycott of the Stadium Village Red Barn as inclusion, as well as the formations of mobs in the Wash-Ave area initially, they did not hold the sustaining action in the area. The bottom line: Memories do stick around, especially ones involving your old group of close, young, able-bodied and possibly tipsy friends. Thousands of students have come and gone through the U, and every single one has created a memory in Dinkytown. Until very recently with the construction of TCF Bank Stadium, the Stadium Village area was considered more or less an after-thought. Changing a major element of Dinkytown is changing a memory for tons of former and current students. Changing a major element of Stadium Village, for many students, is like creating a brand new commercial node altogether. A major change doesn’t seem or feel like a big deal along Washington Avenue. Take a quick glance at an aerial map of campus and the surrounding areas, and note the neighborhoods bordering the University. The neighborhood outside of the commercial Dinkytown are spotted with large fraternity and sorority houses, along with other architecturally significant mansions built by mill magnates before the U became the powerhouse it is. South of Stadium Village lies what is known as the Motley neighborhood, an area which was stripped of its official neighborhood name decades ago and was eaten up by University expansions. What was once a fairly large working-class, single-family residential area was slowly replaced by the Superblocks and the Moos Towers of the world. The neighborhood that remains south of Washington Ave is a rag-tag group of derelict student slum houses and 60’s-era apartments, mixed with a couple re-investments centered toward medical students. 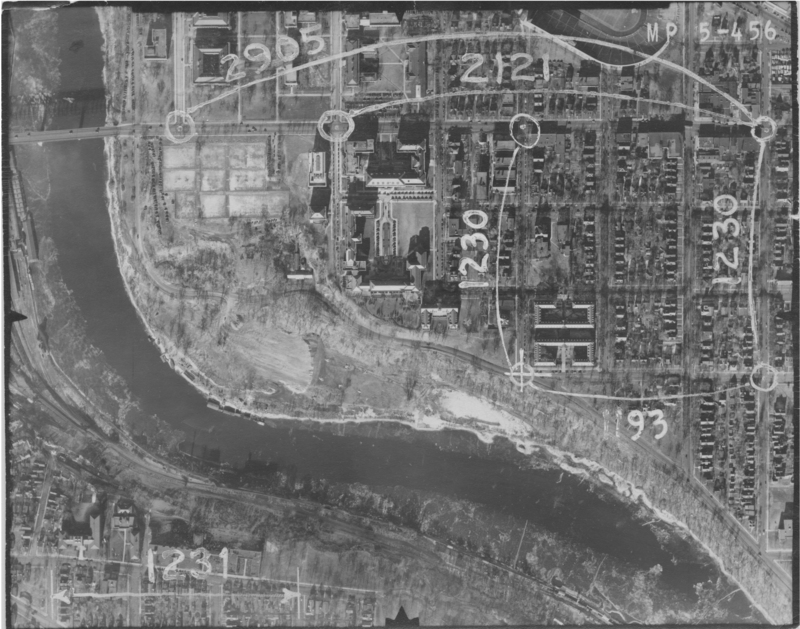 Thanks to the much larger and more significant residential structures of Dinkytown, the University grew south from its origins near the Knoll area off of Pleasant Ave instead of hopping north over 4th Street. Washington Avenue became the center arterial instead of University Avenue, and the varying neighborhood characteristics are probably the cause. Because of this, Dinkytown and the neighborhood has simply been around longer, thus citing a higher demand to keep and maintain the aging. Although the streetcar-era buildings that house staples like the Big 10 Restaurant and Stub & Herbs are well-known, the lack of non-dorm student housing around the area (until recently) left Stadium Village without a permanent population. The Dinkytown neighborhood has consistently fed the businesses in the commercial area, and unlike Motley, permanent residents do reside in the area. That emotional connection to the “roots” of the commercial core are stronger, and therefore result in more NIMBYism. Stadium Village, void of any historic population, does not have the NIMBY attitude, and is therefore more appropriated for change. When the University officially dropped the lawsuit against Metro Transit to allow the CCLRT to be constructed down Washington, the plans for commercial transformation began in Stadium Village. The four-lane mess that once was will soon become a beautiful transit mall; it will incorporate green spaces between stations and will feature 3 city blocks of only-bus-and-bike lanes. The block between Walnut and Harvard will be especially important, as it will be vehicle-less but will still have businesses fronting the street. Larger sidewalks and bike lanes have already been endowed upon the Avenue between Church and Huron, and have created a truly pedestrian-friendly atmosphere. With this transportation revolution occurring, the call for density in the area has been matched significantly. Even though the Doran-built Sydney Hall was first in the University area when it opened in August 2010, only one other apartment has opened in Dinkytown since (412 Lofts, also by Doran). In a matter of two years, four new apartments have opened in or very close to Stadium Village. One is under construction on the former Mercil’s site called The Station, and the six-story uniformity across from the McNamara Plaza resembles a miniature Central Park setting. Two significant developments are being planned by CPM – the 11-story WaHu Housing on the former Arby’s site, as well as a new 6-story development on the strip where Sally’s currently resides. These developments have been met with little resistance from the surrounding neighborhoods thus far, and have only run into trouble with the complicated zoning of the area. The development is also favorable for the new transportation realignments, as the new apartments are being built on parking lots which will not be needed nearly as much as they used to be. The Station and WaHu are both being/will be constructed on lots that had a significant asphalt area. Moving Northwest, Dinkytown has no current readjustment of transportation movements on 15th Ave or 4th Street. The Minneapolis Streetcar Study calls for a new line eventually running down University or 4th Street, but this will probably not happen for at least another 10 years, if at all. 4th Street SE is a like a clogged river during evening rush hour and after sporting events; it is set up with 3 one-way lanes moving West, thus inducing higher vehicle speeds and a higher vehicle capacity. The businesses in Dinkytown do get good exposure from vehicles, and a good street life does exist, but the common fast moving cars are enough to make even the most experienced scholar anxious. Dinkytown will always hold a place in every Gopher heart. The great restaurants and shops of the area will be and are constantly appreciated. Students will probably always head there after parties, and parents will probably take their kids to Chilly Billy’s after their first football game. However, the reminiscing of Bob Dylan memories may be the ultimate curse of the area. When Dylan was the talk of the world, the country was engulfed in vehicle-fever, and a modernist efficiency for parking emphasized the suburban sprawl of the Cities. Dinkytown hasn’t changed much since then. Although the businesses are mostly new, the two-story mixed-use buildings common from streetcar days line the streets just like they did 50 years ago. Stadium Village is another case. With its status as Dinkytown’s often forgotten little brother, its window for improvement and growth is much larger and moves much more liberally. Stadium Village, with the new Green Line about to open and the new apartments lining the now environmentally-conscious avenue, is quickly becoming a model for Universities nationwide. The transit corridor that it will host will be seen as a top-tier example of how a campus can run an efficient and safe commercial area outside of the academic buildings. Don’t be surprised when the fans spill out of TCF Bank Stadium on a warm September evening and head south to Stadium Village, where they can walk around and enjoy the bustling, vehicle-free street life and observe the frequent light rail vehicles moving east and west. The new apartments hosting the ground-level Bar & Grill, est. 2013, will seem as old and as established as a famous diner in Dinkytown. If Dinkytown wants to stay relevant, they should truly look upon their Dylan repertoire and understand that, indeed, “The Times They Are a-Changin‘”. 2) I always felt like Stadium Village (and everything in that direction, including University Village/Commons, Stadium View, Jefferson at Berry, etc) was 100 miles from campus because there was no easy way to get there by bus from Como and it was too far to walk. I suppose the past couple years have been different with the 16 being detoured right through Dinkytown, but that will change when the train is done. But getting from 15th and Como to, say Stadium View, at 10:30 PM on a Friday was just a huge pain and so I never really did it, and I didn’t get the feeling that other people did either. Living in Stadium Village in 2009 or so was like living in a different city. Maybe as the center of gravity for after school extracurricular activities (i.e. partying/etc) moves back closer to campus, that will change. Or I guess now there are enough people living there to make it a destination in its own right. I’d take that, or merely just an aBRT if the costs can’t be justified. I have a personal affinity to trains/trams, but I understand the cost arguments against them (at least short-term). One great thing about the U is that it has so many different neighborhoods/pockets surrounding it – SV, DTown, Seven Corners, Cedar-Riverside, and even the St Paul campus. This is also one of its biggest hindrances to having a cohesive campus “feel” and central area of activity on weekends, gamedays, etc. Linking these neighborhoods together is important. I think extending housing/commercial space along 4th from SV to Dinkytown is important, but also providing convenient transit between these neighborhoods does this. CC LRT will help East/West Bank connection, a Univ/4th streetcar would help Dinkytown to SV. The benefit of both of these is they extend the connectivity to other areas – CC up University to Midway (and beyond), CC to downtown, Univ/4th streetcar to St Anthony. This is important.